These military blocks feature molded-in terminals in an improved Kulka® design for greater strength and flexibility. The mounting holes are covered with molded-in reinforcement straddle plates. A-A-59125 superseded MIL-T-55164-C in 1997. 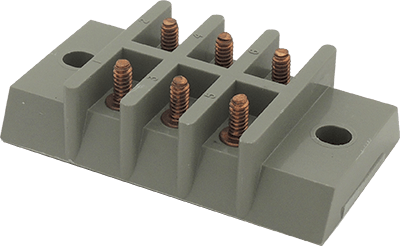 These terminal blocks are compliant to the A-A-59125 standard and are constructed to meet both standards. Molded material is MAI-60 in accordance with MIL-M-14 (Molded material is GDI30F). Nuts and connectors are provided when appropriate. They are unplated brass and shipped unassembled. Marathon Special Products is an industry leader for supplying power blocks, terminal blocks, and fuse holders in North America. We've achieved this by providing one of the broadest line offerings with various sizes, terminal styles, electrical ratings and features.